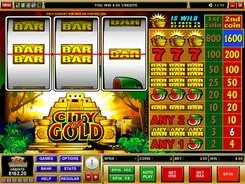 City of Gold released by Microgaming is an easy-to-play Vegas-style slot with three reels and a single payline. Its symbol set is a treasure basket, watermelon, BARs and sevens. 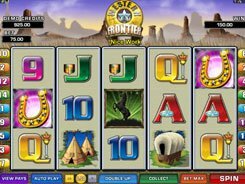 Winning combinations landed on the payline are awarded in accordance with the values displayed in the paytable on the right side of the reels. Before getting started, you have to place one or two coins at stake adjusting a coin size up to $5. A wild symbol is depicted by the treasure chest. 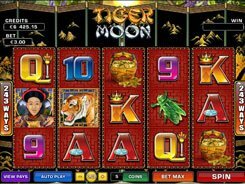 This is the most profitable symbol as three treasure chests grant you 1600 coins – the largest jackpot in the slot machine. Furthermore, the treasure chest acts as a wild that can morph into other images to complete a combination. 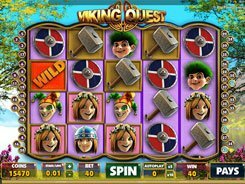 Combinations that employ one or two wild symbols are awarded with a x2 or x4 multiplier. Other symbols are of a lower value. 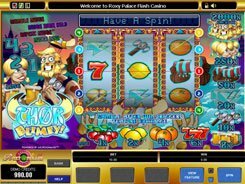 For example, the third-largest jackpot paid out for three 7’s on the payline is 200 coins. 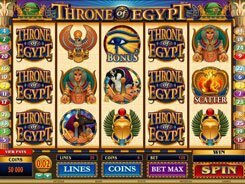 City of Gold is a low variance slot. This means that it gives fairly small, but regular wins.